So I slacked off a little with my “Must Read” posts this summer so this one is a two-fer. Here are TEN books I read this summer that I loved and I think you might too! I love me some picture books and there are probably 30 I could have listed here. But my favorite that I read recently is Jabari Jumps. A beautiful story about what it means to be brave and the journey to that point. **would be a great read aloud for all ages. I am a HUGE Alan Gratz fan. His book Refugee is still stuck in my heart and often on my mind. This summer I picked up Ban This Book (honestly just cause I loved this cover!) I fell in love with this book instantly. About 4th grader named Amy Anne, who is an avid reader and the overprotective mother who comes into the school and starts arbitrarily starts deciding books need to be banned. When the banning gets way out of hand, Amy and her friends decide to take matters in their own hands and use their voices to send a message to the school board. I love science fiction movies and fantasy adventures, but for some reason I don’t find myself reading many of those types of books. Being a big science fiction fan himself, my buddy Brad Gustafson highly recommended Exo to me. Though it took me a few chapters to really get into the story, once I did, I was hooked! A future where an alien race has colonized with earth, but a faction has formed that still isn’t ready to accept the alien race. A great story about learning who you are and having the choice to decide who you want to become. I’ve included two professional development books on this list. The first is Talk to Me by Kim Bearden. Now in all honesty, Kim is like my favorite person on the whole planet so I’m a little biased and adore everything she does, but this book is good. Like really good. Filled with heart and great advice on how we can best learn to communicate and really listen to others. This should be a must read for every adult. ** do a book study over this book with your staff….like now. My friend, Travis Crowder, has been book talking this book to me for almost a year now. And every time he has I think, “I need to read that”. Well this summer I finally made time to pick up Orbiting Jupiter. This book ripped my heart out, shattered it, then pieced some of it back together to help me cope. It is a book that will stick with me for a while. A young man fathers a child at 13, and through events out of his control he’s placed with a foster family. The family helps him cope with loss and longing. I can’t tell you much more without giving the book away, but let me tell you, you won’t be able to put this book down. And it left me sobbing on a plane ride back to Texas. Another book that once I started, I couldn’t put it down. They Both Die at the End is a heartbreaking novel. It’s a future where you get a phone call on the day you’re going to die so you can take advantage of your last moments. Two boys are brought together both on their last day and form a friendship quickly. A story about life, lessons learned, and how we can find those we were meant to find. If you’re a fan of Wonder, then Out of My Mind is a book you need to pick up today. It will give you a whole new perspective on how we look at those with a “disability”. Melody is different. She has cerbral palsy and can’t speak. While those around her have assumed she was dumb and would never keep up, Melody has been trapped inside her own mind, frustrated and broken. Until she’s given a device that gives her the voice that has been trapped in her head. So I mentioned earlier that I am huge fantasy fan and I love superheroes. Savvy is the story of a family where when children turn 13 they learn what their Savvy (or kind of like a superpower) is. When it’s Beaumont’s turn to turn 13 years old, it’s in the midst of dealing with the stress of her father in terrible accident and in the hospital with her mother by his side. Savvy, her brothers, and a few friends go on quite the journey to get to the hospital, because Savvy believes she’s the only one who can help her father. If you’ve heard me speak you know I adore another of Leslie Connor’s books, All Rise for the Honorable Perry T Cook. When I saw she came out with a new book, I had to pick it up. I must admit though, I almost put this book away. I read about 1/3 of it and I just wasn’t hooked. But let me tell you, I am so thankful I didn’t put this book away. It sucked me in and introduced me to a character unlike any I have read about in a while. Mason Buttle doesn’t fit in. He sweats a lot and is a little slower than many of the other kids. And a little over a year ago his best friend died in a tragic accident. But for some reason so many think Mason is responsible. This book is journey into the mind of Mason and what really happened that fateful day. It’s a story about friendship, looking past the surface, and the damage a bully (or two) can really inflict. My second educational book I wanted to recommend is Being the Change by Sara Ahmed. I adore Sara and have learned so much from following her online. She is a needed voice in our world and a truly kind hearted person. Once I picked up Being the Change, I couldn’t put it down. I found myself nodding my head with each chapter and page, yet at the same time watched my horizon’s broadened as I was introduced to new ways of thinking and working with children from all backgrounds. I love this book! **what are you waiting for? Get Sara’s book today!! So there are 10 books I read in June and July that I absolutely loved! What great books have you read recently? 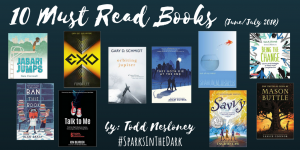 Share in the comments below or on social media with the hashtag #SparksInTheDark.